Peter Sanlon is a vicar in nearby Tunbridge Wells and has turned a series of recent sermons from different parts of the New Testament – Romans, 1 Corinthians, Jude, 1 Timothy and revelation- into a book. It’s short, punchy, contemporary and to the point. No punches are pulled! 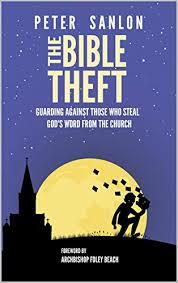 Peter’s theme, which he draws out from a wide range of bible passages, is that the bible is being “stolen” from Christian believers by teachers within the church who refuse to teach (or worse, actively undermine) the core teachings of the bible. Not in secondary or disputable areas but very basic ones such as perhaps the central issue at stake today in contemporary society: sexual morality and the biblical call to sexual purity. His analysis is clear and highly relevant to whats occurring today in the UK. He is careful to distinguish between those outside the church – to whom we are not preaching morality but seeking to point them to Christ – and those inside the church, especially those in positions of authority who either turn a blind eye to sin or even worse teach that evil is good and sin pleasing to God. Here we must indeed “earnestly contend for the faith once for all entrusted”. Nor can we bury our heads in the sand and hope all of this unpleasantness and difficulties just go away. Thinking (especially for those of us not employed by a church) “not my problem” is not an option. For, as Peter notes in the letter to the church in Thyatira, the Lord Himself takes that church to task, not for what they do but for what they don’t do: for tolerating false teaching they should be opposing. He is very good on the ludicrous sight of the church chasing helplessly after our contemporary culture : as if imitating the broken world will somehow help the church. He rightly points out that we have to be radical in our discipleship, imitating Christ not the world, and that a desire for unity and love, though important, cannot be allowed to unilaterally overturn biblical truth. This is a common argument “lets agree to differ” and there are many areas (baptism, ecclesiology, last things, creation, worship and liturgy, spiritual gifts all spring to mind) where we must do so. But on the absolutely fundamental gospel matters such as the ones Peter covers this is not possible.